A charming apartment on several levels in a 16th century aristocratic building including: kitchen, bathroom and living room downstairs; bedroom and bathroom upstairs. The living room enjoys a view over Menton's old port and Sablettes beach. The apartment is located in one of the oldest buildings of the city, next to the famous staircase leading from Quai Bonaparte to Saint Michel's Cathedral. The building surface is 70 square meters and it has been recently renovated, keeping its original appearance. The priest of the nearby cathedral may have dwelt in it in the past, as it is proved by the engraving with religious motifs, dated 1533, on the jamb of the front door. Street level: entrance with a coat hook and some room for beach items. Downstairs: kitchen with dishwasher, washing machine and dryer, bathroom and living room. Upstairs: bedroom with one double bed and two single beds, all with futon mattress, and a small bathroom. Note: The floors can be accessed throughout an old-fashioned, and therefore narrow, slate staircase. 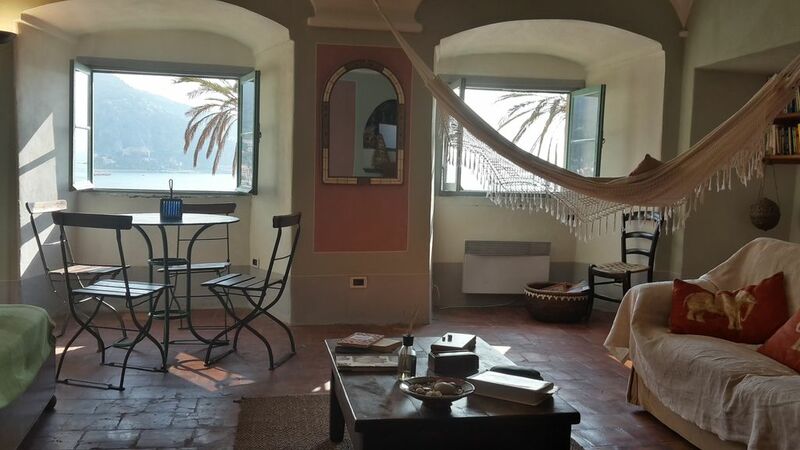 The living room overlooks Sablettes beach and the old port, and beyond the French-Italian border, the view reaches up to Balzi Rossi rocks, with their prehistoric caves. The kitchen, in masonry with a stone sink, is equipped with electric hotplates, refrigerator, dishwasher, washing machine and dryer. It is furnished with old furniture and overlooks the staircase leading to the cathedral through a basement window. A small bathroom with shower (without window) and a closet is located next to the kitchen. The upstairs level houses the bedroom, converted from what once was a local warehouse, and a small bathroom. The main feature of this area is a vaulted ceiling whose top height is 170 cm in the bedroom and 160 cm in the bathroom. However, the highest spot is just over the double bed with an approximately 190 cm height. The bedroom has two windows facing the inner street and the bathroom has got a basement window overlooking the staircase. A person in charge of check-in and check-out will welcome you, and will be available in case of need during your whole stay. You will directly get in contact with me for any agreements and correspondence prior to your arrival. Warning - An underground parking is being built between Quai Bonaparte and Sablettes beach, the works should be over within this year. The most important and annoying works have already been completed. The beach is always accessible. We are Italians, we live in Turin and we have a total of five children (three Maria Giulia, Andrea two). We come in Menton during summer usually for a few weeks holiday with our children. The apartment belongs to the Maria Giulia family for generations, since Menton was still part of the Italian territory Maria Giulia has planned the restoration and chose the furniture recovering part of the old furniture remained. The result satisfies us very much! We enjoyed the quirks of the house and the attractiveness of the area. It was warm enough to swim in the sea! We'd recommend to others. My wife and I could not have been happier with our stay in Andrea's apartment. While we didn't meet Andrea, Simone checked us in/out and he was most friendly/helpful. Communication with both Andrea and Simone was always timely and professional. The apartment was clean, well-furnished and in an excellent location (directly across the street from the beach and very near many great dining options). We especially enjoyed spending time in the breezy living room, where we would relax in the hammock overlooking the beach (my new happy place) or enjoy a happy hour at the table by the windows. The one call-out I'd make is to be aware that given it's location so near the beach, noise from passerby at night can be a factor, but it certainly wasn't significant enough to stop us from giving our stay 5 stars. Our only regret is that we didn't book a longer stay! Amazing history - stunning location! The other reviews summarize the unique nature of this wonderful apartment. Andrea communicated quickly and effectively and made our stay as perfect as possible. Yes, this is an old building - the date above the outside door reads in the 1500's. If you have been to Menton you can imagine the feeling of staying in a place that opens out onto a view of Basillica St. Michel - a view from your bedroom and your front door. The location is so amazing we often noted looks of jealousy as we walked by/through tourists taking pictures of the Basillica and steps and into our very own front door right off the steps. Although we were tourists ourselves, there is something about what this place does to your mind and soul if you can relax and take in the location, the feel and the history of the place and it makes you feel a part of Menton and its soul. The pictures actually fail to capture the breathtaking view out of the windows and yes, the noise is there, but these are the sounds of summer on the beach - a piano bar and other restaurants on the street below and just life in general - it easy to close the shutters but never was necesary. We were able to prepare several amazing meals from the nearby markets and found that everything we had to "adapt" to was part of the experience of truly being in Menton. If you have not been to Menton and want to truly get the feel and have the city affect you - this is the place to stay - you will never be the same. We have left part of our hearts in Menton and we have taken some amazing memories with us - a fair exchange. We will be back and we will make sure it is at a time when we can stay here again. This was the second time we stayed in this charming apartment with a wonderful view of the Mediterranean. Morning coffee at the window looking out to the sea provided an experience we will never forget. Andrea and Maria Giulia are excellent landlords and were responsive to our needs. They arranged for their representative in Menton to pick us up at the gare routière, being there for us despite our flight delays. Residing in old Menton in an ancient building was a special experience in itself. It was easy to communicate with Maria and Andrea. This was very helpful as we booked only one week in advance. They also offered great suggestions for food. The location of the apartment is absolutely amazing. It's situated among the charming streets of the old town in Menton while also being directly across from a public beach. This section of public beach was under construction (gladly they weren't working over the weekend) during our visit so we opted to pay for lounge chairs at a private beach, just a 5 minute walk further. We really loved the interesting architecture of the apartment and the decor. It was lovely to lay on the hammock and read while looking out at the beautiful water. All of their pictures on HomeAway represent the apt well. The only reason my review is 4-stars (instead of five) is because the beds are all futon mattresses. This was not in the description and I find futon mattresses very stiff and uncomfortable. This made it hard to sleep well. Also, it's good to note that if you visit during a hot time of year, the bedroom does feel warm. It is on the top floor so air circulation isn't as good as the living room. They have one standing fan for the bedroom, but an additional would help. If futon mattresses do not bother you then this is a 5-star HomeAway apartment in Menton. The apartment was just as beautiful as the pictures lead you to believe. We loved the convenient location to the restaurants and sea.